What is shut and what is open ? NORMAL SERVICE IS SUSPENDED......... don't be caught out. August 15th, Summer holiday day - Assumption day. Click for best online rates for hotels on main routes and in main cities in Fance. Unlike in the UK, when a public holiday falls during a weekend in France, there is no extra compensating holiday on the following Monday. However, "le pont" - the bridge - is a popular French institution, and when a public holiday falls on a Tuesday or a Thursday, many workplaces remain closed for the Monday or Friday too, meaning that certain services will be closed for four days. However, shops and banks and post offices tend to open normally when there is a "pont". Note also that most public museums are closed on TUESDAYS - but this is not always the case. For information on Paris museums, see Paris Tourist Attractions . Nonetheless, small corner shops and essential services (such as boulangeries, small supermarkets) can open on Sundays if they want to, and indeed Sunday is the busiest days of the week for many patisseries. So in any town, it is usually now possible to buy fresh bread and groceries on a Sunday, particularly on Sunday morning. More information on the Shopping in France page. In recent years, French shops and shoppers have been increasingly demanding more freedom to open on Sundays. In 2015, the "Loi Macron" gave a lot more freedom to shops to open on Sundays - notably to garden centers and furniture stores . Paris now has seven "tourist zones" - including the Champs Elysées, the rue de Rivoli, the boulevard Saint Germain, Montmartre and the Marais, where shops can open on Sundays. In addition big Paris department stores Galeries Lafayette and BHV le Marais are open Sunday. On the outskirts of Paris two large shopping centres ("zones commerciales") are open on Sundays. One Nation Paris at Les Clayes sous bois, near Versailles, is the largest fashion factory outlet village in France. La Vallée Village Chic is a large factory outlet shopping village near Disneyland. More and more shops are now open in tourist resorts - defined as places where tourism is a major activity - during their tourist season; which means that nowadays, in seaside resorts, Paris, and even in small country towns, essential supermarkets, shops that cater largely for tourists, and and some other shops now open on Sundays. Sunday opening however is often just Sunday morning, so it is best not to plan a shopping trip anywhere in France on a Sunday afternoon, except in the busiest tourist hotspots. Intercity train services operate more or less as normal on Sundays; suburban and urban transport operators, including the Paris Metro, run a lighter service, particularly on Sunday mornings. Particularly in small provincial towns, many shops are closed on Monday morning - so don't plan a big shopping trip on a Monday morning if you are on holiday in rural France. A lot of French provincial museums and monuments are also closed on Mondays. However supermarkets tend to be open as normal on Mondays, even in small towns. This is the day on which a lot of museums and national monuments are closed. It is particularly the case with national monuments and museums, such as the Louvre and the Centre Pompidou in Paris. Many businesses, administrations and shops will actually shut down completely for a week or two in Late July or early August, though shops are unlikely to close during this period in tourist areas. The closure of public administrations during August can be particularly frustrating. Strikes and barricades France has the reputation of being a country prone to strikes. In actual fact, it is not a country where strikes are particularly commonplace; it is just that they tend to occur in high-profile sectors, in places where they are very visible and affect the lives of millions of ordinary men and women; i.e. in public services and in the transport sector. Public transport is a sector frequently affected by strikes, that can bring rail services or airports to a halt nationally or regionally; and all kinds of workers in France have a habit of blocking roads, ports and railway lines in defence of their objective. Such events are strongly mediatized, but actually relatively rare. Foreign tourists often find it hard to understand why blockades are not quickly dispersed by the police; but this is part of the French way of life, a legacy of the Revolution and the spirit of the "barricades". Increasingly, police are brought in to disperse blockades, but generally not until after the striking workers or students have had time to make their point. 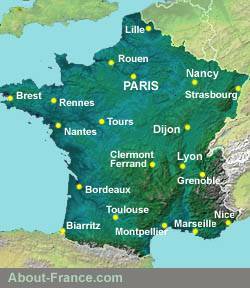 For information about travelling in France, and avoiding problems and traffic jams, see the Driving in France page. Roads are also particularly busy on weekends that mark the start of end of school holidays, particularly school holidays for the Paris region.